(CNN) -- The pumping sound system is getting louder, indicating I am getting closer to my destination. The Tour makes its way through the countryside on Tuesday. When I eventually arrive I see a person in a fluffy white monster suit entertaining the massed crowds by gyrating to "Wannabe" by the Spice Girls. I admit it is not a sight I have witnessed before -- then again I've never been to the start of a Tour de France stage before. I am in Limoges, a city of approximately 130,000 people that lies in the mid-west Limousin region of the country. It is famous for its porcelain and violent thunderstorms -- a reputation I can attest is well founded after experiencing the heavens opening in spectacular style the night before. Despite the drizzle in the air, there is a party atmosphere. 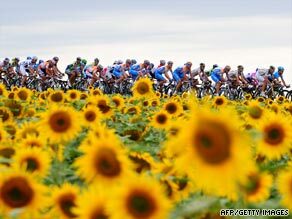 Not only is the Tour de France, the most celebrated sporting event on the French calendar, in town -- but it is in town on July 14, Bastille Day. With the possible exception of American Independence Day, no nation celebrates their heritage to such a degree as the French on Bastille Day. Add the Tour de France to the mix and you get a day steeped in French history, culture and society. Except I am not seeing a lot of evidence of French nationalism at the moment, apart from the Tricolor flags flying above a building that looks like a courthouse -- which, no doubt, would have flags flying every day of the year, regardless of the date. The booming sound of Euro electro-pop has usurped "girl power" over the speakers as throngs of people, standing five deep, wait for the cyclists to sign on, prior to the 194.5km 10th stage to Issoudin, due north. There is a strange mix of curious locals, lycra-clad cycling enthusiasts and media -- lots of media. It is difficult to know what causes more excitement, the emergence of seven-times Tour champion Lance Armstrong from his sumptuous Team Astana bus, or the vast procession of cars, floats and sponsors vehicles that proceeds the race -- throwing a variety of goodies, freebies and treats to the grateful masses. I see an Australian flag. Matt, from Brisbane, is lapping up the atmosphere. "This is my first Tour and I love it. You can get so close to the riders, they are very accessible, it's not like any other sport. I'm following the race around France and having a great time." But what about Bastille Day? This is the day of all French days, a national public holiday. A day commemorating the events of July 14 1789 -- when the Bastille prison was stormed by inmates, which was seen as a symbol of the uprising of the modern nation, the start of the French Revolution against the constitutional monarchy. But, for a city like Limoges, the Tour de France's visit seems to have taken precedence... until the evening that is. "There will be fireworks, tonight. Bands will be playing and there will be plenty of dancing and drinking," said 38-year-old France, a woman with the most appropriate name it is possible to have on Bastille Day. "We just want to remember the fact we had a revolution," added 42-year-old Laurent. "But I'm not sure that there is much significance to events that happened over 200 years ago any more. Now it's just the chance to celebrate being French and the togetherness of the French people." The giant fluffy white monster has ended his grueling dance-a-thon and takes a back seat as the riders file away and leave Limoges. The locals will celebrate many more Bastille Days, but it is unlikely they will ever see the legend that is Lance Armstrong cycle past them again.